In this tutorial, you will learn how to create a (minimal) Google Keep clone app with the Model-View-Viewmodel (MVVM) framework Vue and Firebase as a backend. Vue introduces easy to use building blocks in the form of components. Each component has its own ViewModel and can be composed of other components. What sets Vue apart from Angular is that Vue has a less steep learning curve. It focuses much more on providing an easy way to compose components and nothing more. For this tutorial, you will need some experience with ES6 aka ES2015, Node, and a little Vue. You must have NodeJS installed on your device. You can find the source code at Github (tag part_1) and play with the demo here. The starting point of the app is ‘src/main.js’. With .vue files you can write HTML, CSS, and JS all in the same file. This makes it very easy to develop with a component-mindset. Note that you can write ES6 code inside the script block without worrying about browser compatibility! Webpack will use Babel to compile ES6 code to ES5. You can also add support for any other loaders like TypeScript, CoffeeScript, Sass, Less, etc. If you followed the default when creating your project, eslint will be enabled by default. This will force us to follow the standard code styleguide. Make sure to pay attention to use 2 spaces and no semi-colons! Log into Firebase and create a new app. You can create an app for free for development purposes. You will need the app-URL in one of the next steps. Import Firebase at the top of main.js. Next, pass the Firebase app link to a new Firebase instance. Now you can start adding, modifying and deleting data with Firebase. Make a notes array and add one note object to test if it is working. When you look in the browser, you should get a popup saying ‘hello world’. 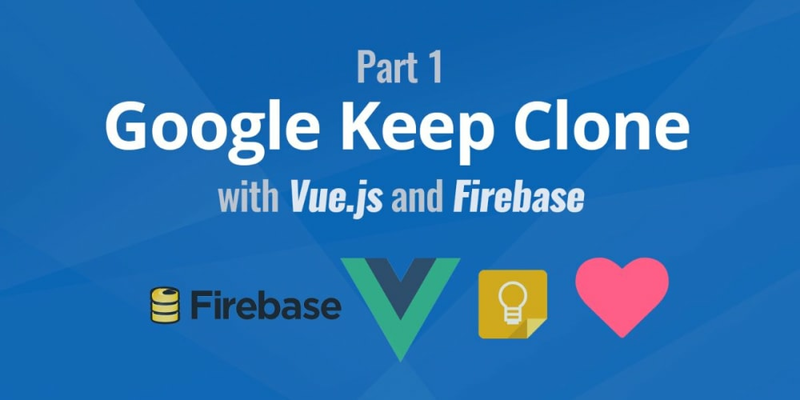 You just hooked up Firebase to your Vue-app. Next up is creating your first component! We will now create a component to present all notes. First, create a new folder ‘src/components/notes’ to put all note-related components in. Create an index.vue file inside the folder you just created and copy the following content to it. This is the barebones for a Vue component. Note that the template, script, and style can be omitted if you do not need them. The Index component will hold all notes. First, add the data method to make Vue aware of the notes array. Now remove the Firebase code from main.js and import Firebase in the component. Create a new Firebase-instance and listen to the child_added-event for your notes in the ready-method. The child_added-event will first iterate over all the existing notes in the array, and also immediately trigger when someone adds a note to the array. This means when somebody else adds a note, you will instantly be notified through the event. Grab the data in the callback and add it onto the notes array with the unshift method. Instead of pushing an element onto the end of the array, unshift will add the element to the start. This makes sure that the most recent note is displayed first. Now add a simple template that iterates (v-for) over the notes and prints out the data in JSON-format using the json filter. When we check the browser, there&apos;s no difference. That’s because we aren’t using the component yet. Replace everything under div#app in App.vue with a notes element. If you reload the browser now, the note that was added previously in main.js is outputted in JSON-format. If no note is appearing, try adding a note manually on the Firebase website. Now that you can render all the notes, create a component for an individual note. By adding strings to the props property, you can define custom attributes/properties for the component. Define an attribute note for the component. Now you can simply pass the note object through thenote attribute. Note that we are using a pre-tag instead of a paragraph. The pre-tag is used for preformatted text. This tag will respect &apos;\t\n&apos; characters that come from the textarea. Though the sentences don&apos;t get broken automatically and overflow the width. With some CSS the pre-tag has same behaviour that other elements have. Now back in src/components/notes/Index.vue, you need to change the template to use the Note component. In the script you also need to import the Note component and pass it to the components object. Now add some style to the App component at src/App.vue. Awesome! You just nested two components into each other passing data from the parent component to the child components. Next up is creating a form to make new notes. By now it probably doesn’t come as a surprise that you again are going to create a component for this (component-ception!). Inside the new vue-file, create a form in the template and return an object with two properties (title and content) in the &apos;data&apos;-method. Bind the data to the input and textarea using the ‘v-model’-directive. Create a method called ‘createNote’ in the methods object and bind it to the submit-event of the form. Inside the method check if either the title or the content has been filled out. If so, create a new note and push it to the array through Firebase. Also pass a callback to reset the form when the note has been pushed to Firebase successfully. Using the v-on:submit.prevent="createNote()" you can trigger the ‘createNote’-method when the form is being submitted. The ‘.prevent’ is optional and will prevent the default submit behavior just like event.preventDefault(). Now don&apos;t forget to import and use the component in App.vue. Now you are able to add notes, and they will automatically be inserted through the child_added-event. The app should look something like this now. The notes get laid out next to each other because of float: left, though this will not always look as good. That&apos;s why in the next section you will implement the Masonry-library which will take care of the layout. Masonry is a great library for building dynamic grids that will layout dynamically depending on the width of the grid items. Now import it in the Notes component. Add the v-el:notes attribute to div.notes so you can reference it in the Vue instance via this.$els.notes. At the time Masonry is instantiated there are no notes, so you need to tell Masonry that there are new items in the callback of &apos;child_added&apos;-event and also tell it to lay out the notes again. This won&apos;t work directly in the callback of child_added-event though because at that point the new note will not be rendered yet by Vue. Do it on the nextTick-event, which is similar to nextTick from NodeJS. There you can be certain that the new note is rendered and Masonry will correctly lay out the new item. To make sure all the notes are nicely centered, replace the padding with margin: 0 auto; and add the fitWidth: true option when initializing Masonry. In the Note component we can remove float: left; and change the margin margin: 8px 0;. We just created a mimimal notes app that looks like Google Keep with VueJS and Firebase. We integrated Masonry with the Notes component to handle layout of our notes. Unfortunately there is still a lot missing. So far the app only covers the CR of a CRUD-application. It&apos;s still missing UPDATE and DELETE. In the next part, I will show you how to implement UPDATE and DELETE functionality. I will also show you how to abstract our Firebase logic to an independent data layer to keep our code DRY. Currently every client using the app is sharing this list of notes. In one of the next parts, I will also introduce authentication and give each user its own list of notes. Let me know if you have any issues and I will try to get back to you. This is my first tutorial ever, so don&apos;t hesitate to give feedback. I hope this tutorial was helpful. I am a Belgian Developer focusing on .NET and front-end. I studied New Media and Communication Technology and graduated with a focus on programming. I love building delightful digital experiences with the newest technologies available. Building something that helps people and makes users happy is what drives me. I am always looking for opportunities to learn new languages, frameworks and tools, and share my knowledge and skills!